When I was a kid, if anyone asked me what my favorite vegetable in the whole world was, I always said spinach. I didn't know if I was just doing it to be contrary. I was the kind of kid who if everyone liked something, I hated it, and if they hated it, I loved it. Go figure. Most of my friends would run a mile from most vegetable but I was scrawny, asthmatic and had bouts of anemia, so spinach was nearly always on the table. 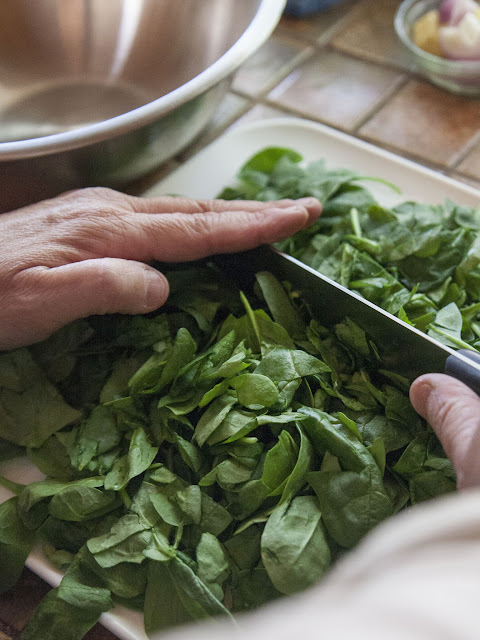 Considering that most of the spinach that was fed to me as a child was frozen, it's probably shocking that I enjoyed eating it so much and that there was a nutritive value left after it was given the Fran treatment of cooking everything within an inch of its life. If spinach wasn't being pushed at home, it was being pushed by this guy, Skipper Sedley. 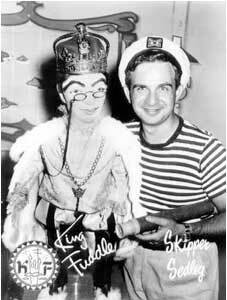 He hosted an after school kids show in San Francisco from the late 50's into the 60's that featured Popeye Cartoons where a lot of spinach was consumed, with stunning results. Yes, I believed this. 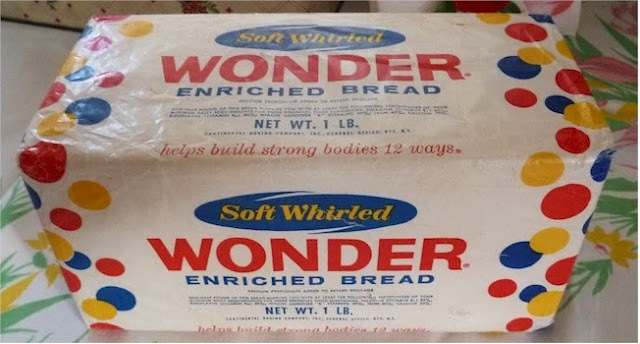 I also believed that my new Keds could make me run faster and jump higher, that Maypo tasted good and that "Wonder Bread built strong bodies 12 ways!" Notice this bread is marked as being "soft whirled" whatever the hell that meant. I was the pawn of guys like Don Draper who just lived to sell stuff to kids like me. Madison Avenue saw me coming. Growing up in a blue collar working class household, 90 percent of the time my parents couldn't afford to give me the stuff I saw on the TeeVee. So instead of the Keds I got some generic brand from the White Front Store in San Francisco's Outer Mission District. Maypo was too fancy. Cereal came from the bulk bin and forget Wonder Bread. My parents insisted on buying their bread from an actual local baker! Dark, dark, thick unsweetened pumpernickel for sandwiches. The jaws of life could get through a peanut butter on pumpernickel sandwich a lot faster than an 11 year old with braces on her teeth. Spinach however was never substituted. That was always the real deal. 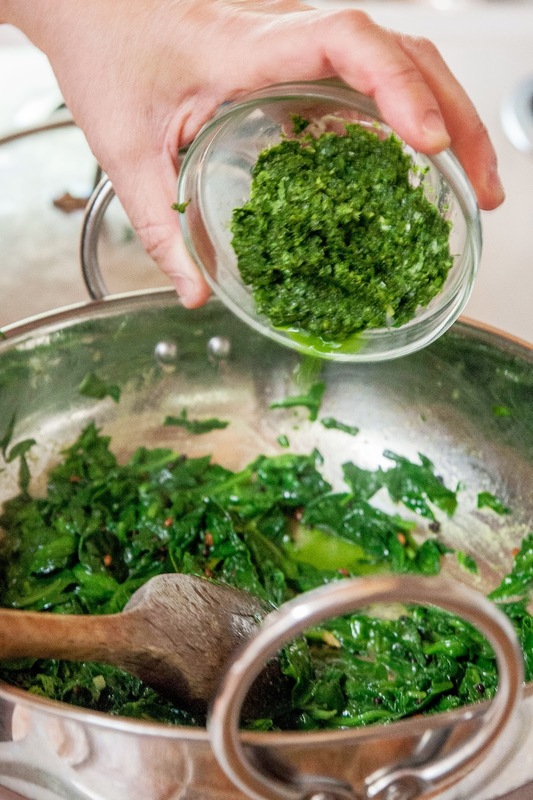 But plain old spinach can get boring. 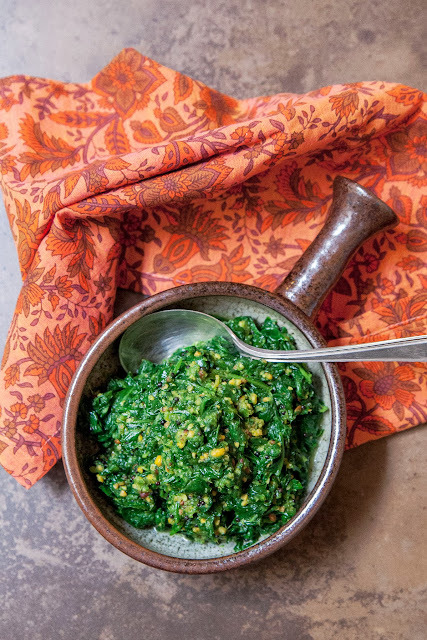 Sure, one can dress it up with garlic or shallots and olive oil, or pour cream into it with nutmeg, but until I started cooking Indian food, spinach seemed rather limited. 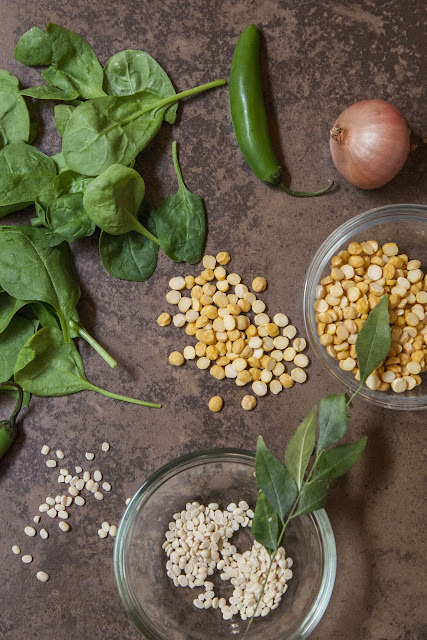 Indian cuisine uses Spinach and other greens - yes Virginia there are other greens - though a lot of Americans never eat them, and some never even hear of them. The recipe that you see below actually originates in Andhra Pradesh and is made with Amaranth Greens. It seems like everywhere but here seems to know about this nutritious green as most of the world has been eating it for a long long time. 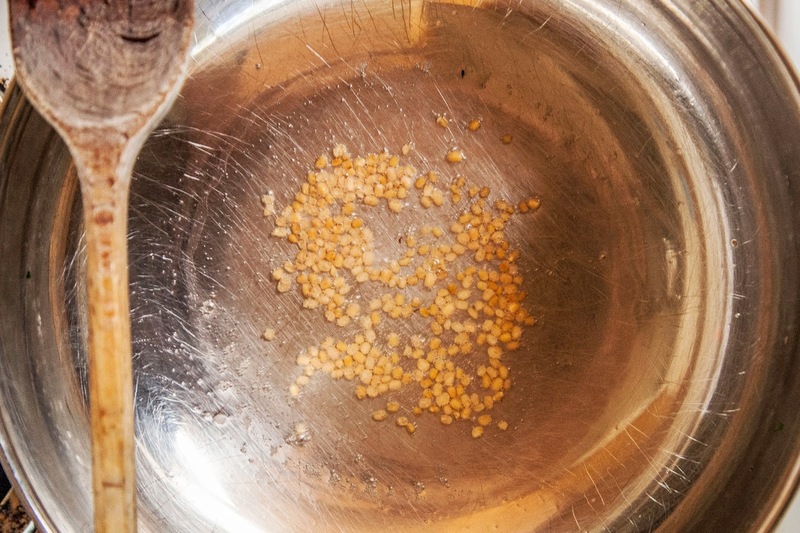 The closest I've been to amaranth is amaranth grain. In Ancient Central and South America the Aztecs and the Incan people grew huge amounts of it. The grain or rather the seed is super high in protein, and gluten free. I've seen the grain and flour in markets, never the leaves. 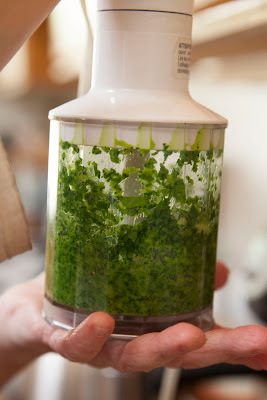 So, in this case if you cannot get amaranth greens any nutritious green will do. 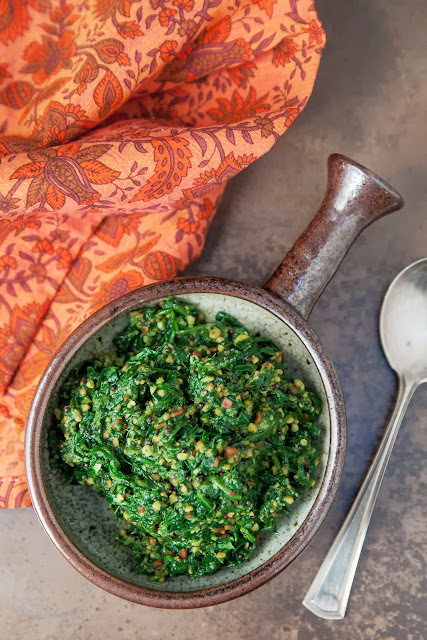 In this case, I made a very simple substitution for spinach and the resulting dish kicked this very simple vegetable out of the park! 6 or 7 curry leaves with the stem. 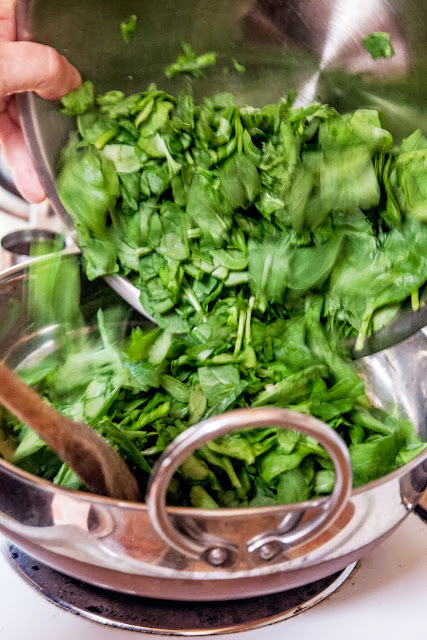 Wash , dry and chop the greens you plan to use. After you've chopped them you should have about 6 cups of greens. Put the ginger, shallot, cilantro and chilies in a grinder or blender. 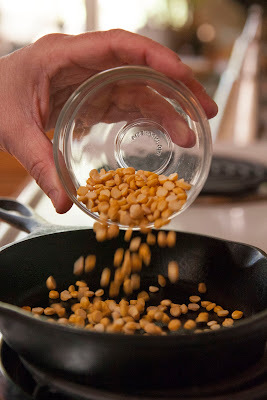 Add a little bit of water and grind them to a paste. 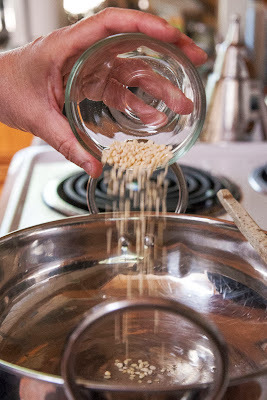 If you plan on using already ground plain garbanzo bean flour, which is also known as Besan flour, dry roast the 3 Tbs of flour in a small pan until it takes on a light toasty color and set it aside. 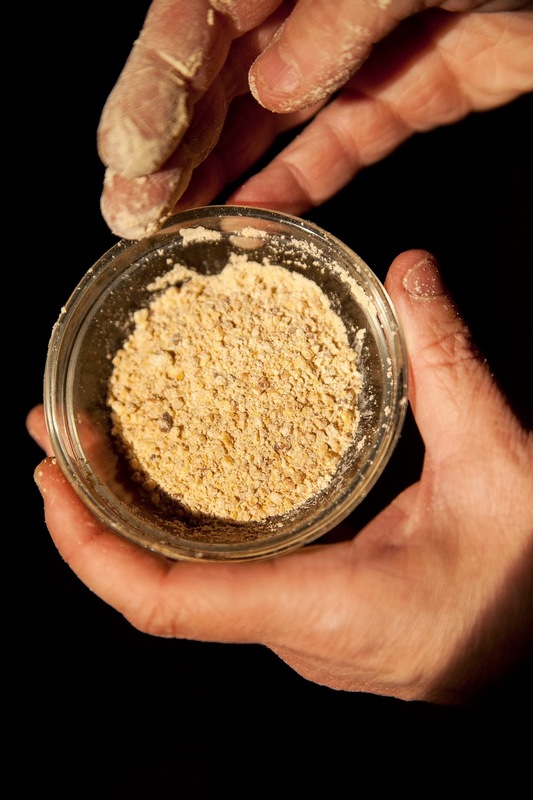 If you want to grind your own gram powder, here's how. Toast the dal until it turns a darker golden color. It only takes a few minutes, so make sure it doesn't burn. 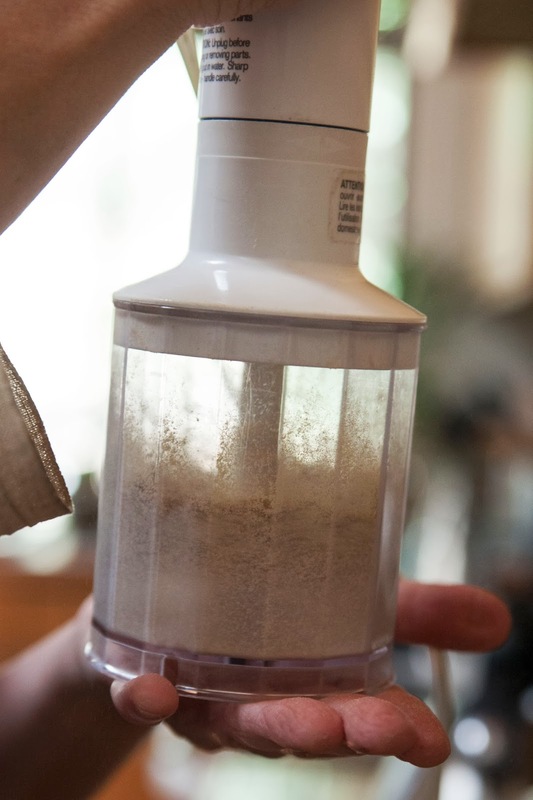 Put the toasted dal into a grinder and grind it to a powder. Set the powder or flour aside. Heat the coconut oil in a skillet, kadhai or wok. 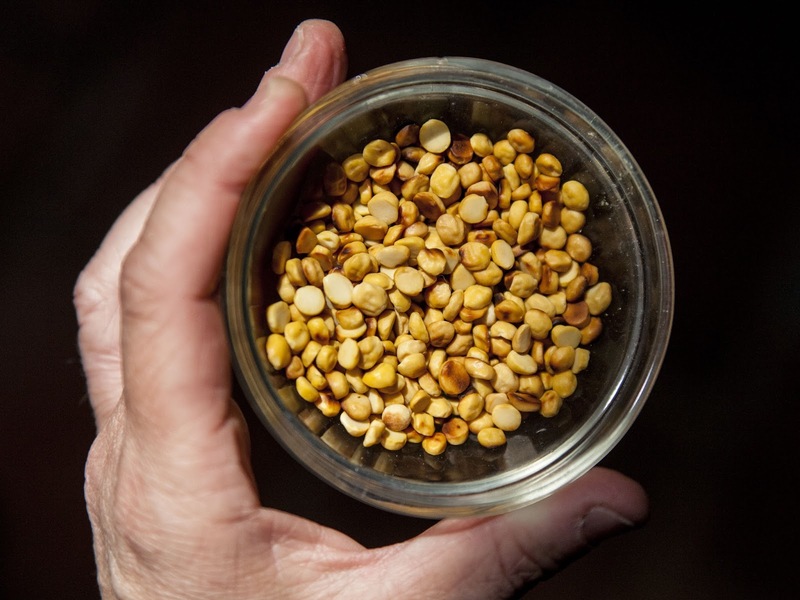 When the oil is hot, toss in the urad dal. It will start to turn rosy gold. When it does, add in the mustard seeds. 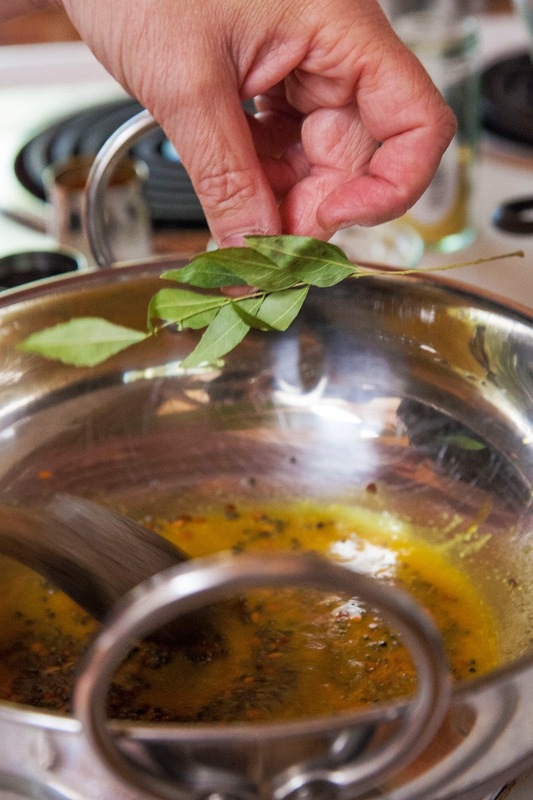 Stir everything well and toss in the curry leaves. Mix it all up, and put the chopped greens into the pan. Put a lid on the pan and turn the heat down a bit until the greens are cooked. Depending on what sort of greens you've got, this may take a few minutes. Spinach cooks very quickly. Chard and kale take a bit longer. 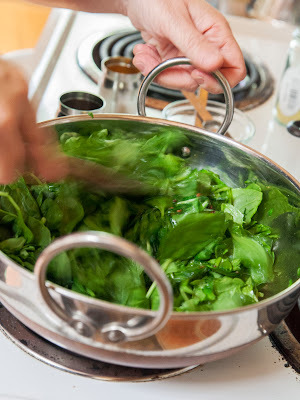 Collards and mustard greens also take a bit longer to cook than spinach. When the greens are wilted, and cooked through, remove the lid and add in the ground ginger paste. Add salt to taste and stir everything well. 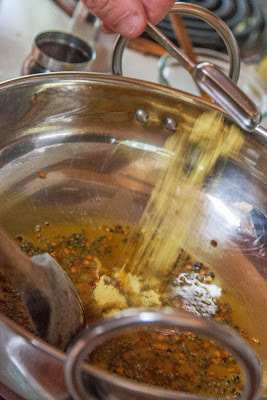 Let this blend cook for another 3 or 4 minutes. 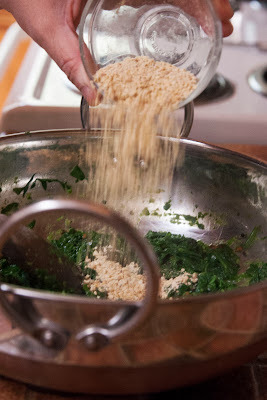 Take the pan off the fire and stir the toasted gram powder/flour into the spinach. Stir it up and serve it. Mmmm. This sounds DELISH! I have all the ingredients but may leave out the chickpea flour to keep the carbs lower. Can't wait to try it! Spinach is one of the few veggies I've always liked - especially when cooked like this! I've always loved spinach especially this way. Thanks Anu, i'll check out your site too. Am finally catching up with this post and WOW, it looks gorgeous. This is one of my favorite types of dishes. Can't wait to try it. Thanks Rebecca, let me know if you try it. Nothing's better than fresh spinach!